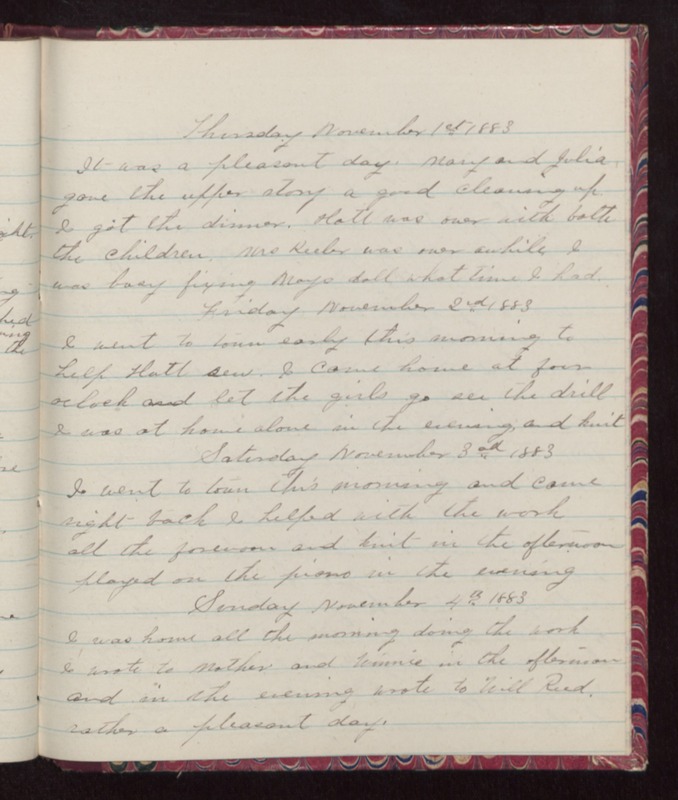 Thursday November 1st 1883 It was a pleasant day. Mary and Julia gave the upper story a good cleaning up I got the dinner. Hatt was over with both the children. Mrs Keeler was over awhile. I was busy fixing Mays doll what time I had. Friday November 2nd 1883 I went to town early this morning to help Hatt sew. I came home at four oclock and let the girls go see the drill I was at home alone in the evening, and knit Saturday November 3rd 1883 I went to town this morning and came right back I helped with the work all the forenoon and knit in the afternoon played on the piano in the evening Sunday November 4th 1883 I was home all the morning doing the work I wrote to Mother and Winnie in the afternoon and in the evening wrote to Will Reed. rather a pleasant day.